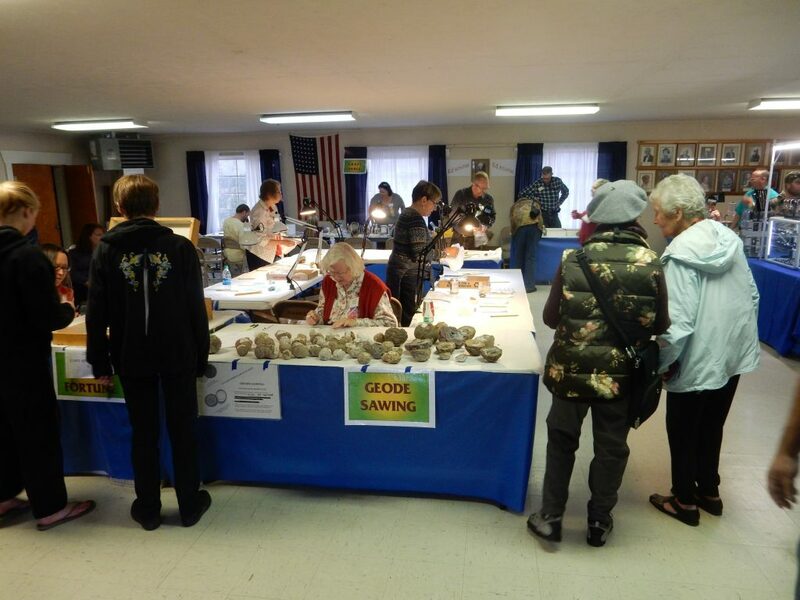 This is an annual show put on by the Los Alamos Geological Society, usually on the first weekend of December. It has become something of a holiday tradition for me, since it’s held at the Masonic Lodge just down the street from the Mormon chapel that holds a creche show every year on the same Saturday. 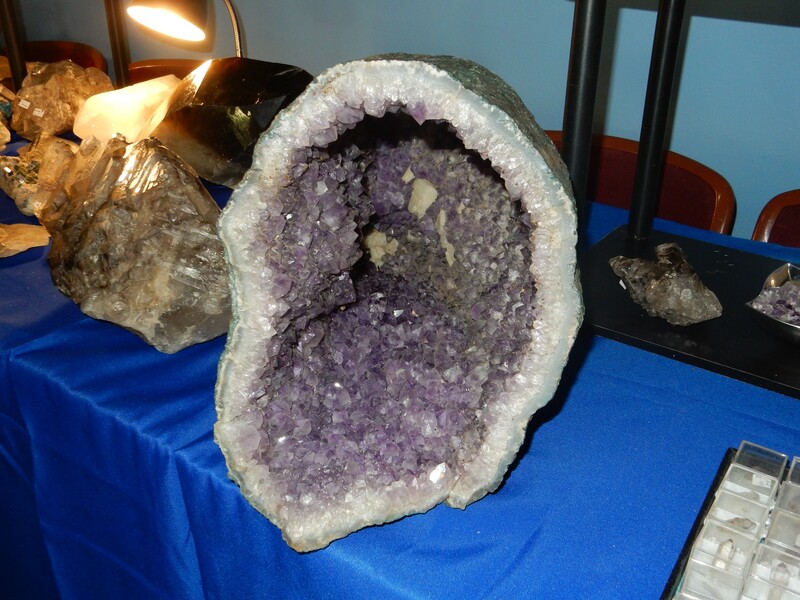 A fixture of the show is geode sawing. 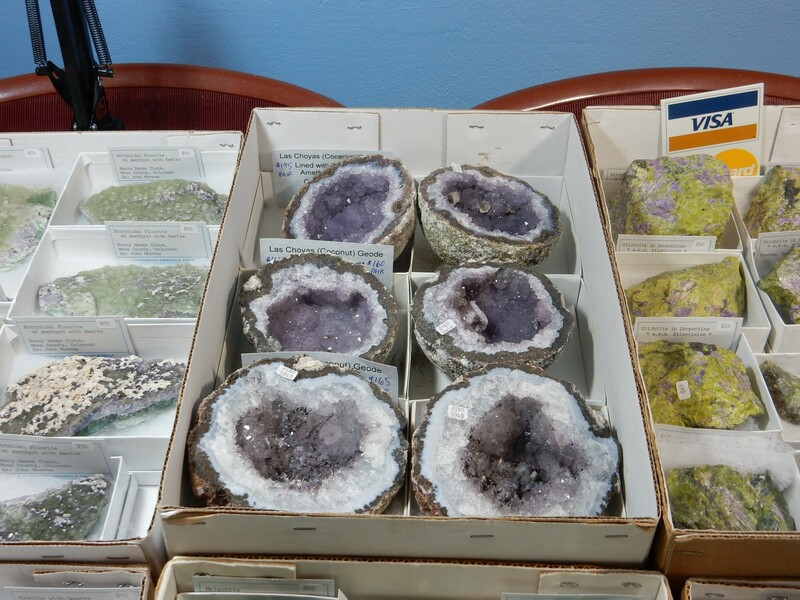 You pick out your geode, pays your money, and it gets cut for you out on the front porch. 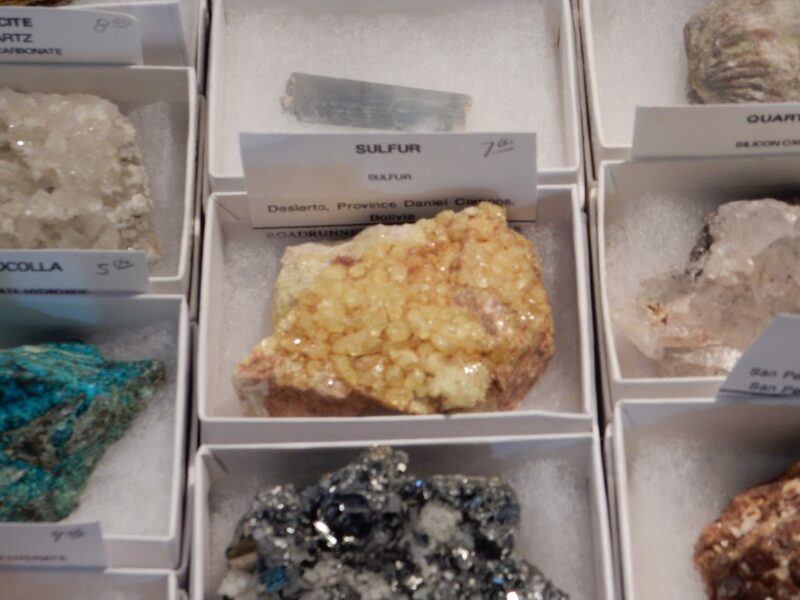 I took advantage of this last year, paying a modest fee negotiated on the spot to have a septate nodule cut that I had collected on a Geological Society field trip to the Nacimiento mine. I later sanded and polished the cut surface, and it turned out quite well. 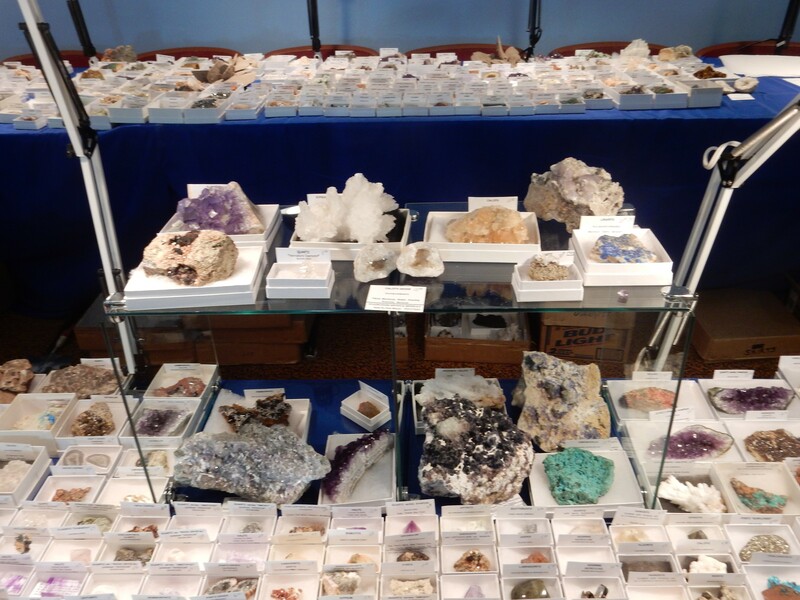 Behind the geode stand is a silent auction area for rocks and minerals (typically of modest value). There is a sheet for each offering, with a minimum bid (usually in the <10$ range) and bidders silently write their bid on the sheet. You can come back and up your bid if someone else has outbid you. After a certain length of time, the bidding ends and you collect your sample if you were the high bidder. I picked up a fairly decent sample of biotite this way one year. 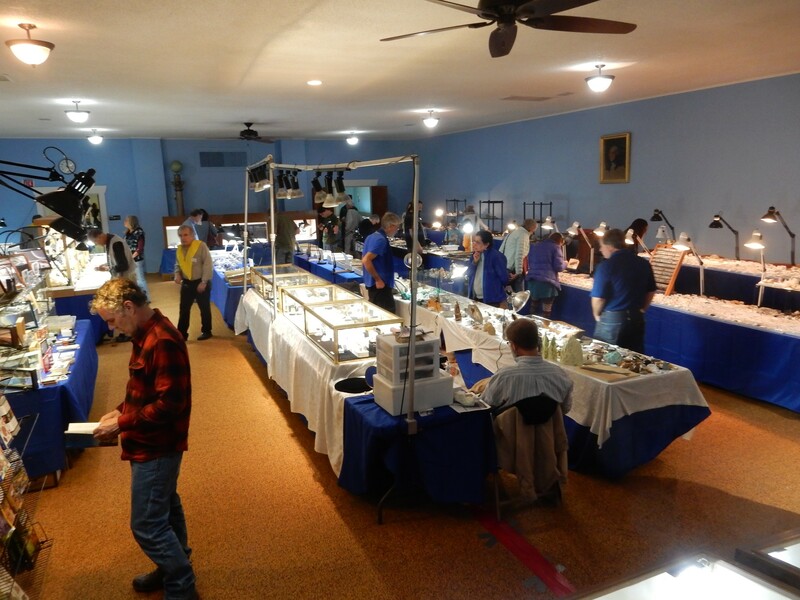 It’s not a large show, but it’s a pretty nice show, and there are usually a few items that are both within my limited budget and worth having. And there is lots to goggle at. This year seemed particularly photogenic to me: Naturally, I found that the battery in my camera was completely dead, and I had to run home for fresh batteries and come back to take these photographs. From the minerals present, I’m guessing this is a skarn mine, where magma intruded carbonate rocks with their high pH and weird and wonderful chemistry took place, producing beautiful mineral crystals. The only skarn mine I’ve collected at is the San Pedro Mine; a wonderful way to spend a Saturday. 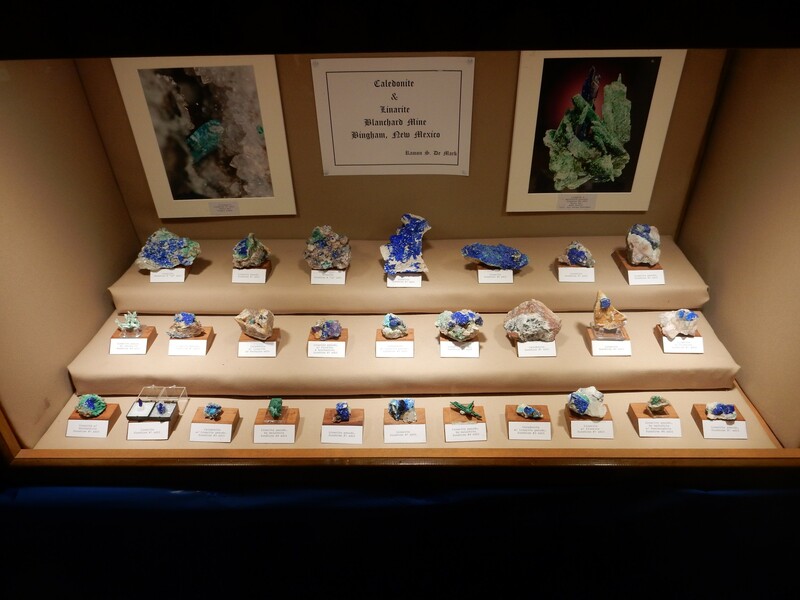 New acquisitions of the Mineral Museum of the New Mexico Bureau of Geology and Mineral Resources. 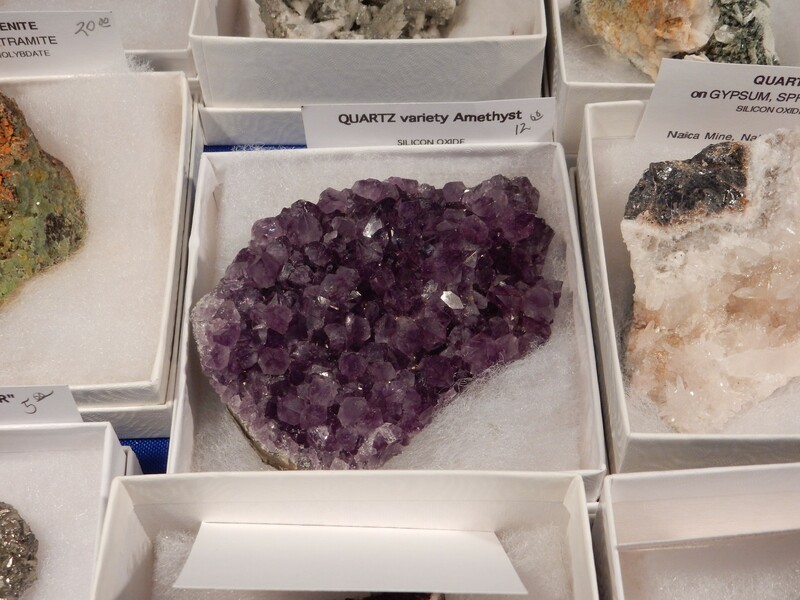 The least of these museum pieces would auction for hundreds of dollars. Here’s one my paleontologist friend Bruce Rabe will appreciate. 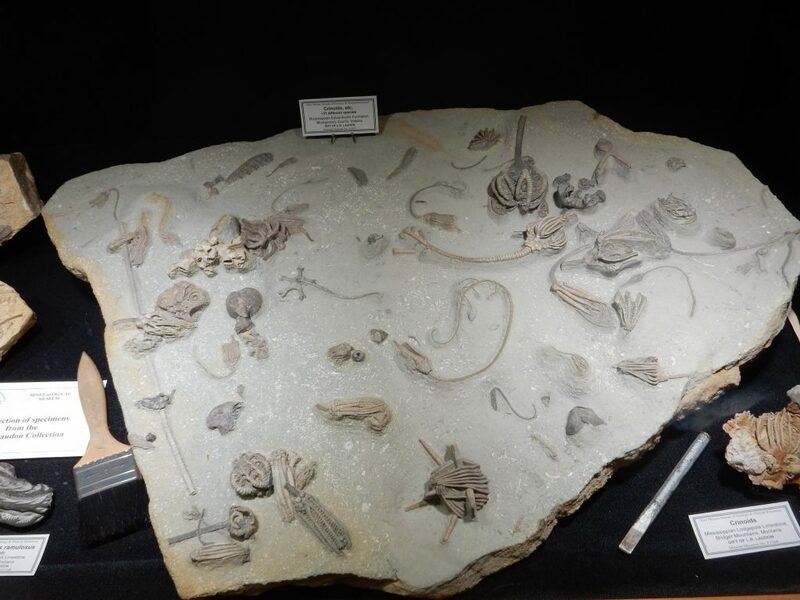 Mississipian crinoid fossils. Over thirty species are represented here. 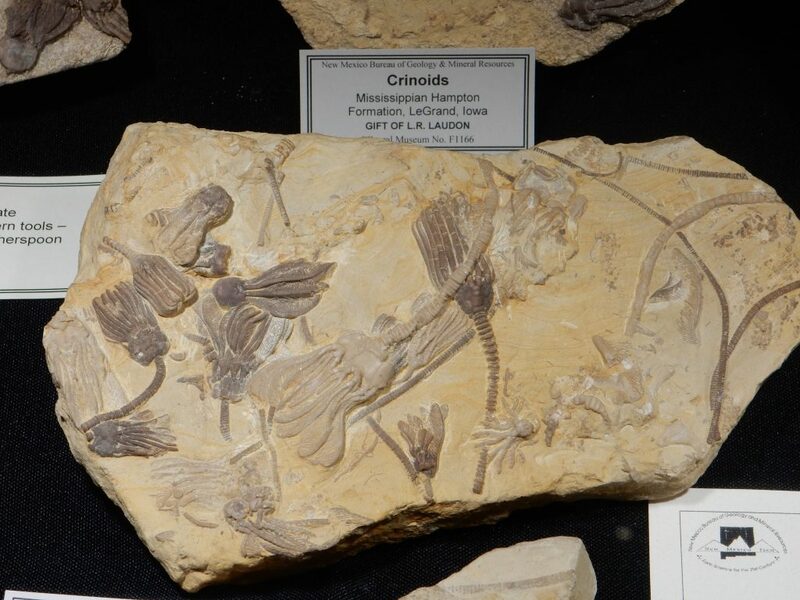 Crinoids, or sea lillies, are echinoderms, distant relatives of starfish, sand dollars, sea urchins, and sea cucumbers. They are still present in the modern world, but peaked back 330 million years ago. Copper minerals from the Blanchard Mine. 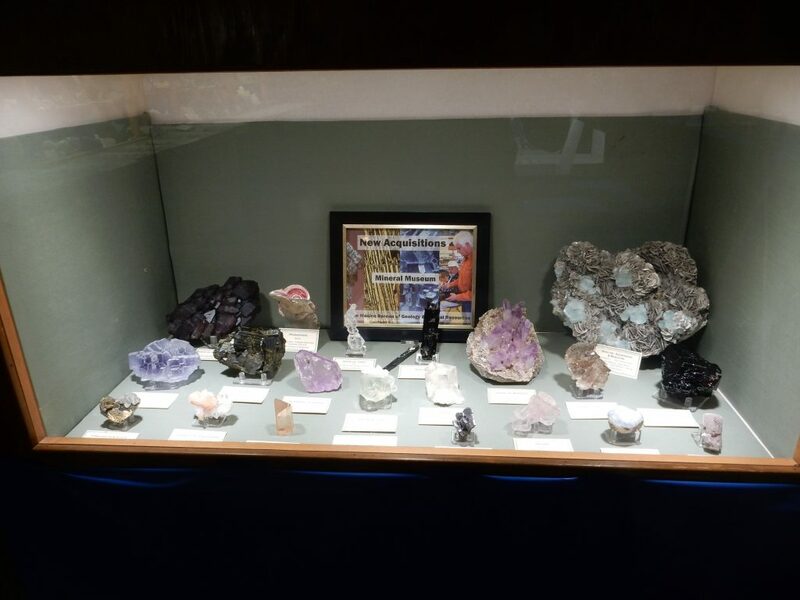 Some fine collections from LAGS members. There’s no name on these displays, but I’d venture a few quatloos Patrick Rowe was involved. 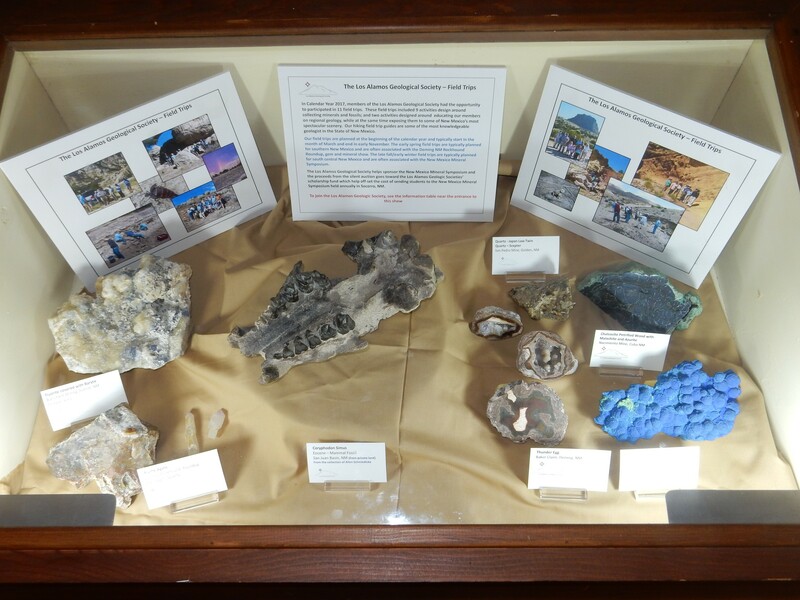 The Kelleys have led some very fine tours for LAGS, and Shari Kelley’s name appears on some excellent geological maps and papers for the Jemez area. Many of the items for sale were also quite interesting. I was tempted, but stromatolites are normally found in Precambrian limestone and are typically more finely laminated, so I found myself giving them the hairy eyeball. 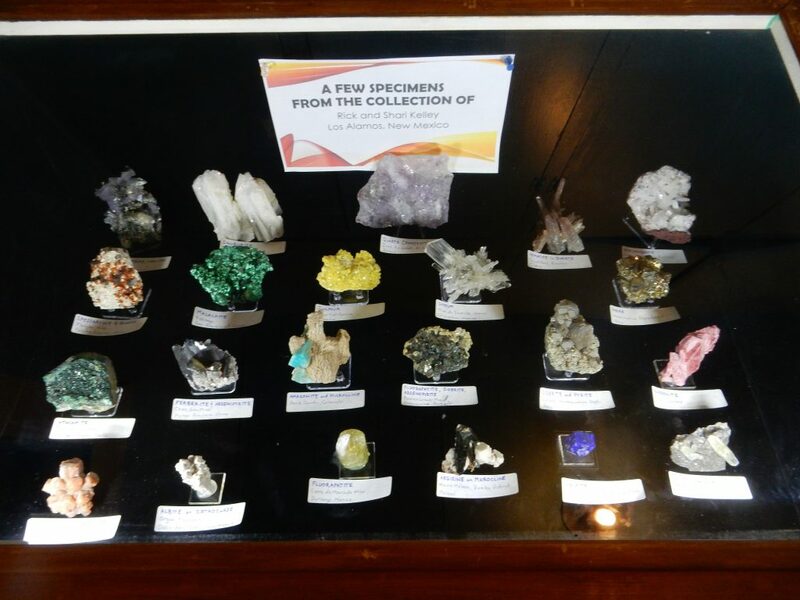 When I asked about them, the proprietor volunteered that, while these were cool and he would be happy to sell me one, these were not nearly that old — Cretaceous, apparently — and were a bit unusual in being formed by replacement with sand. 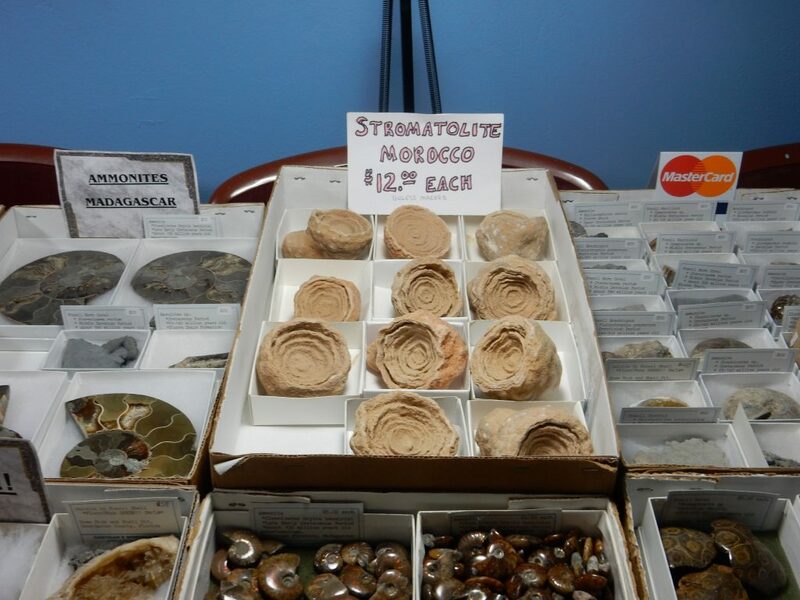 So they’re on the level, but not quite what I would look for in a stromatolite. I’d probably have got one anyway but for my limited budget and other more attractive options. 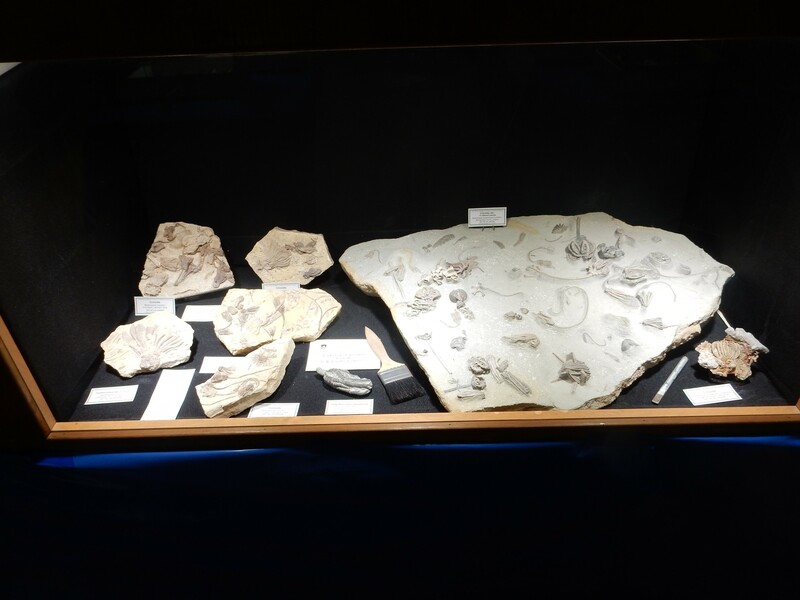 Fossil squid. Well, not exactly, but kind of. Some nice wares, mostly out of my budget. 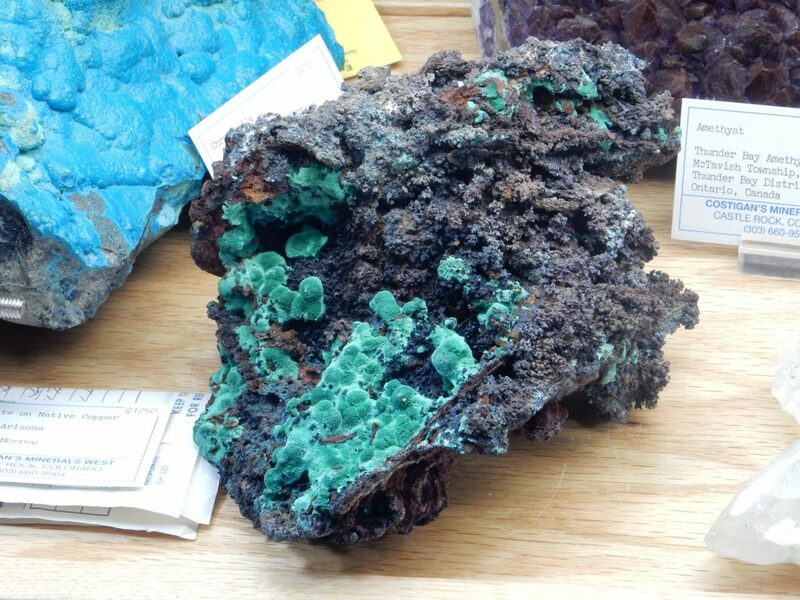 Some very, very nice, and very much out of my budget, fibrous malachite on native copper. 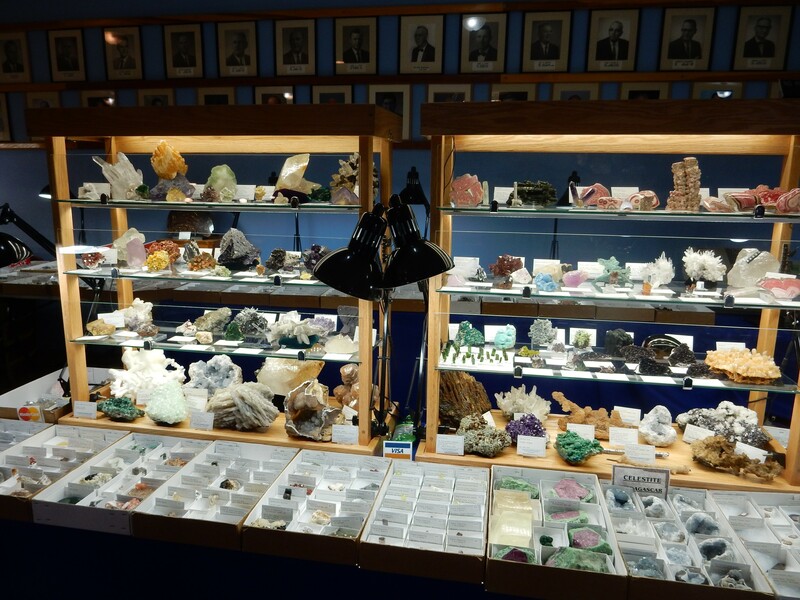 There’s one table, Roadrunner Mining and Minerals, that I almost always buy something from, because they have reasonably nice stuff that’s within my budget. I’m bummed the picture came out blurry. I took three and none worked. It’s too bad; I wanted to use this one for the book. The sample is within my budget but I chose something else; probably ought to have just purchased it. 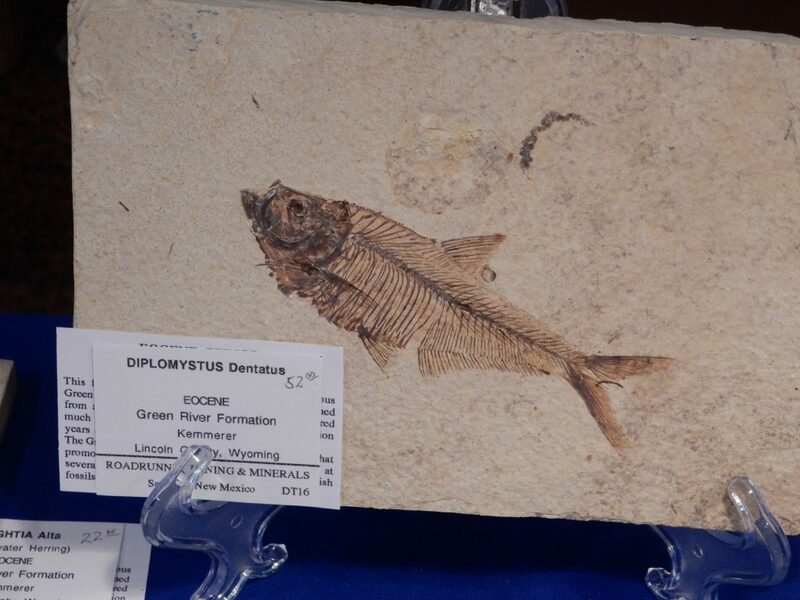 One of the best Green River fish fossils I’ve seen. Just a little outside my budget, though. 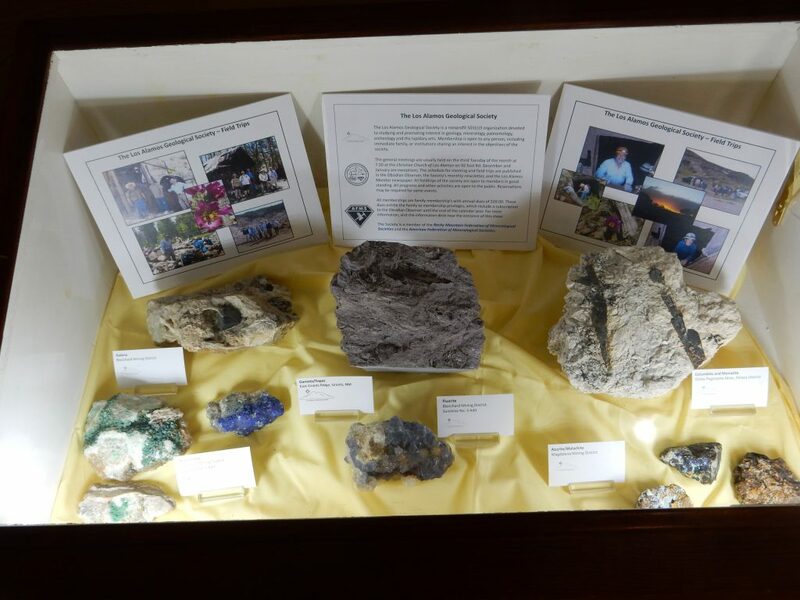 What really bebothers me is that, when I came in the morning, there was a really impressive basalt block full of peridotite xenoliths on display, for $150 or so. 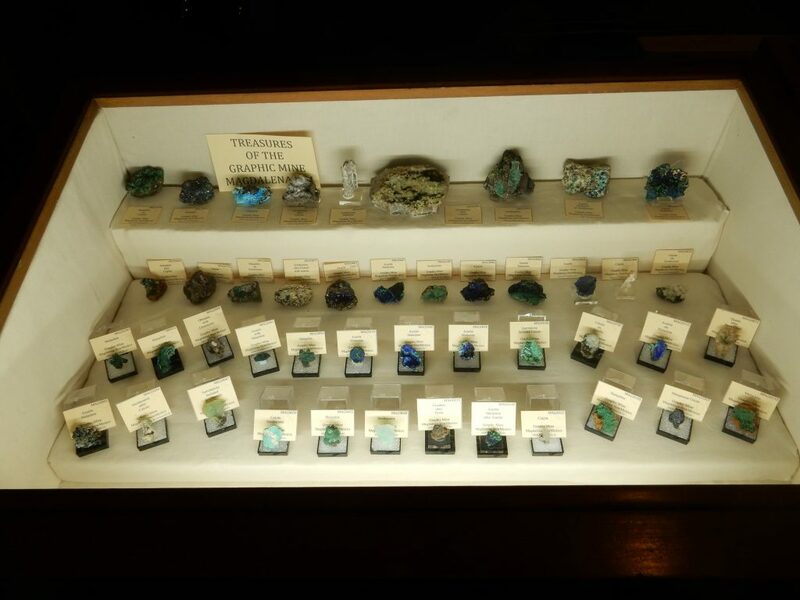 I’ve never been so badly tempted to spend way more than I can afford on a rock, at least since getting engaged 26 years ago. Alas, when I came back with the camera with its batteries recharged, the basalt had already found a new home. I would love to have gotten a photograph, which would have been great for the book. So what did I buy? A fossil coral from the Devonian, a block of very nicely crystallized magnetite, and three ammonites. I got the first ammonite for my niece, Catherine, for Christmas (sshhhhh, don’t tell), who has expressed interest in rocks ; then I figured I ought to get one for her brother Tim, who also has shown some interest in geology; then I thought, shoot, I might as well get one for myself. Just $4 each. My only worry is that these were carved out of plain sandstone by enterprising Moroccan Arabs; but probably not, and at that price, I don’t much care. No pics? My wife already confiscated my purchases, to reappear in my stocking at Christmas. Yeah, weird, I know. A nice show, as always. Foot update: I’m up to a mile a day walking on fairly level ground in my boot. Monday, if all looks good, I’m supposed to be out of the boot. Will report back then. * No, they really are nice. I just couldn’t resist the classic reference. Nice to see you up and about again. 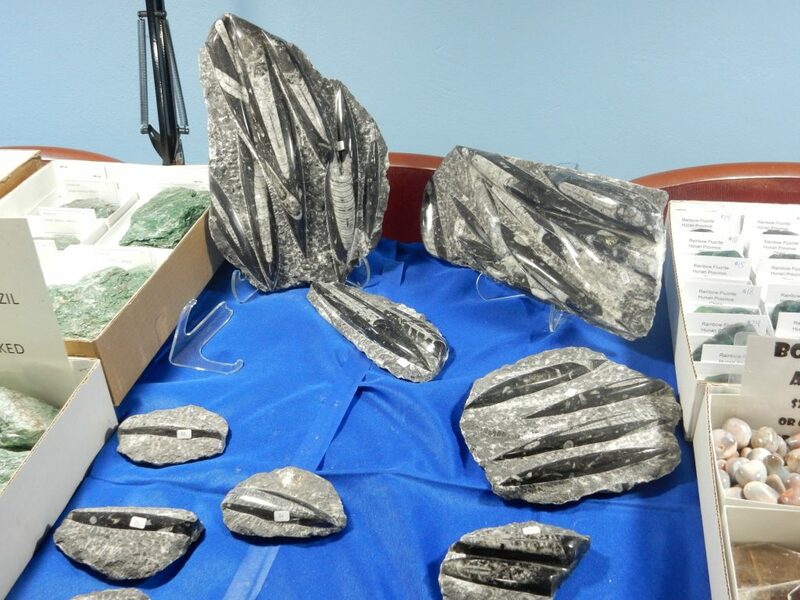 Morocco is pretty notorious for fake fossils. 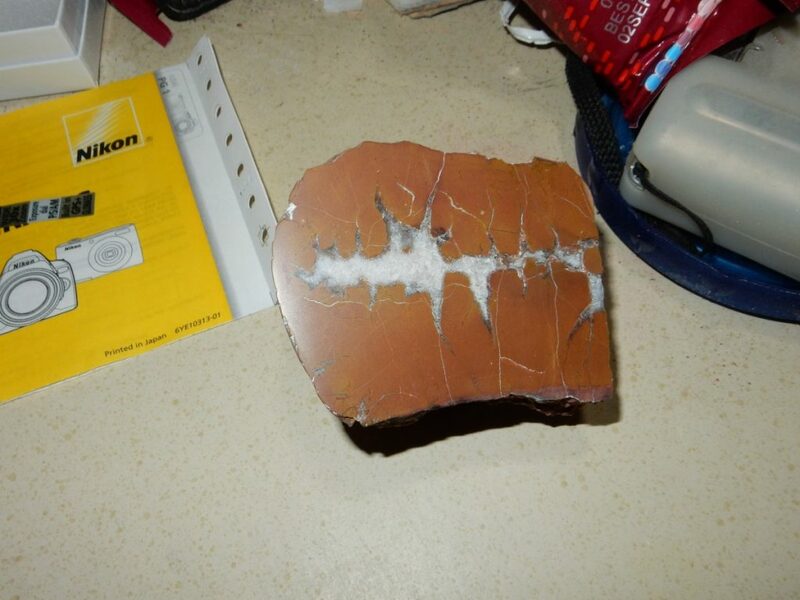 Anything in sandstone is suspect, as it’s pretty rare as a fossilization medium. If you are ever up this way again, we can go to a commercial site just outside Florissant, where you can pick through Eocene shale for $10/hr. Got some nice plant fossils, a tipulid fly, and a bee last time. And one reason for giving the stromatolites the hairy eyeball is that they could so easily have been carved with a tool. Glad I didn’t purchase. I’m reasonably confident the coral is actually coral, though not necessarily actually Devonian. I’ll post the pictures in three weeks. A bee in your bonite!